California Pools is being featured in the October edition of House 2 Home magazine. I thought our loyal readers would like a sneek peak! Is Your Pool Builder Learning with Your Project? More frightening than jack-o-lanterns and vampires is the scary thought that your new pool builder is really more of a student than an expert. Yikes! Knowing how many pools the company has built before you choose a pool builder could mean the difference between a backyard dream-come-true and a backyard nightmare. Choosing award-winning California Pools and Spas eliminates even the possibility of a novice working on your project. 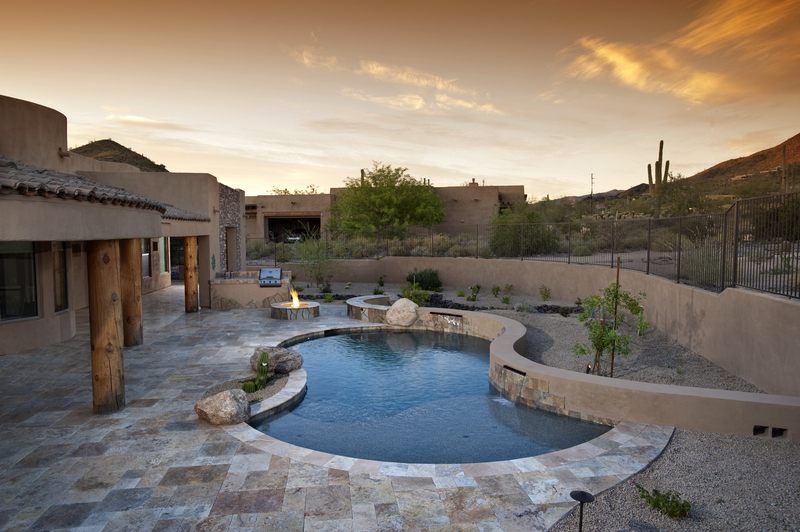 Since 1988, they’ve built over 20,000 pools and are ranked among the top three builders in Arizona. That’s an average of over 900 pools per year! Owner, Jeremy Smith explains how that came to be. It’s true. According to the Registrar of Contractors, California Pools and Spas has never had a single complaint filed. Zero in 20,000 is an amazing record for sure! Some pool builders change their license number to wipe their slate clean. Shoppers are advised to compare the age of the company with the year on the license. If they don’t match, the builder could be hiding filed complaints. Homeowners come to California Pools and Spas for whole backyard solutions. Besides pools and spas, they offer landscaping and hardscaping to round out a complete outdoor living area. Waterfall features, bar-b-ques and outdoor kitchens can help make a backyard into a paradise retreat. And with prices lower than they’ve been in 10 years, why wait? Pool shopping at California Pools and Spas begins with scheduling a free consultation at the home. After an extensive interview about what the client wants out of the project, 3-D renderings are created, giving the client a very real and clear picture of what their project will be upon completion.